Mum to Zachary and Leela, yoga teacher, birth doula and childbirth educator, Thea Mistry is passionate about supporting women as they rise to the challenges of pregnancy, birth and motherhood. She has been dreaming of amma since her son was born and she learned the importance of "finding your moms". 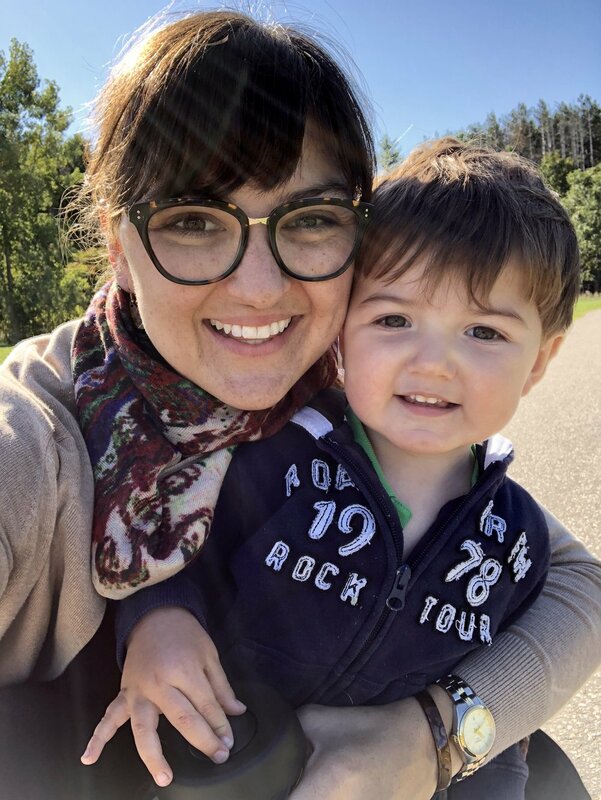 Before moving to Kitchener from Toronto in the Fall of 2014, she worked primarily withToronto Yoga Mamas, Baby & Me Fitness, and bebo mia, teaching prenatal yoga and birth preparation, mama and baby yoga and vinyasa flow, facilitating a mama group and supporting women through labour. Her yoga classes flirt with the boundary between challenging and nurturing in a fun and accessible flow that connects movement to breath. She engages yoga as a tool to still the mind and open the heart. She loves witnessing friendships taking root in class and creating a space where people can find solidarity in shared experiences. Her original Yoga Teacher Training was with Dru Yoga in the UK, followed by an Intensive in Rishikesh, India. Sasha Padron's Prenatal Yoga Teacher Training fundamentally shifted Thea's perspective of birth and motherhood and started her on a life-changing journey. She also completed a 20 hour workshop on Teaching Yoga & Meditation to Children Ages 2 1/2 - 12. Darryn Rhodes' yogahour teacher training challenged her to use clear language and teach authentically. The Bellies Inc. Certification challenged everything she thought she knew about prenatal and postnatal fitness and core recovery. She trained as a Birth Doula with Melissa Cowl and certified with DONA International. Thea teaches with a contagious joy and strives for her students to step off their mats smiling, feeling centred and strong. Amanda Watkins came to yoga in 2012 when she experienced first-hand its healing benefits for both mind and body. 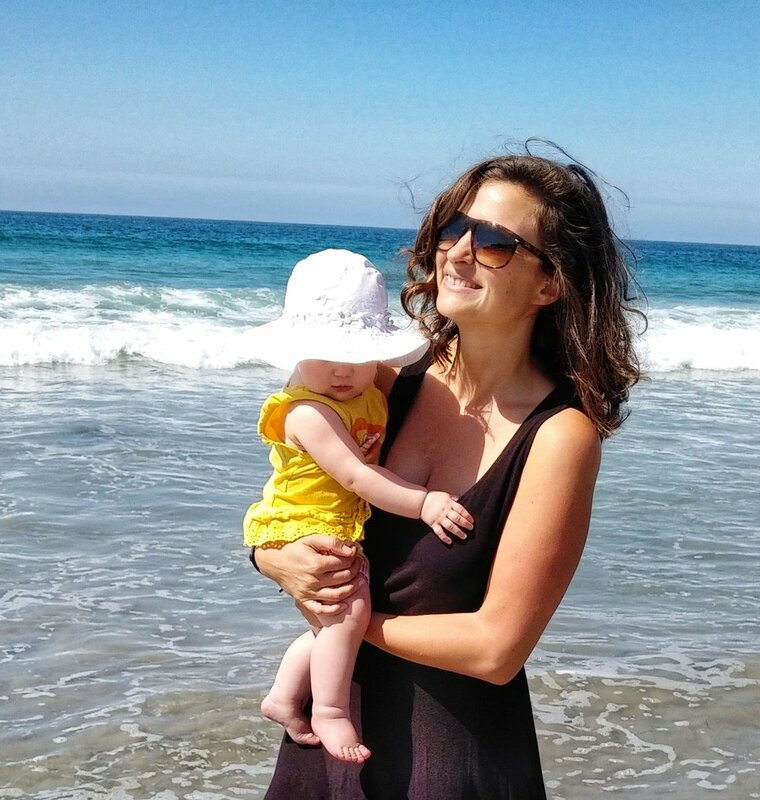 Becoming a Mom in 2016 brought Amanda into her true purpose, to care for her beautiful child, and to extend this nurturing, loving attitude far and wide. Bringing this new mindset to her yoga practice, Amanda has become passionate about supporting others, especially mamas, both on and off the mat -- the same way she was supported by the Amma Yoga community as a student. With renewed meaning to her life, Amanda completed her Yoga Teacher Training, in both Hatha and Vinyasa yoga, at Fusionmovement Yoga Studio in Cambridge, Ontario with Natasja Payne. Amanda’s classes are gentle in nature, and are focused on careful alignment, flowing with the breath, and strengthening the body and the mind. She believes that yoga can be transformative, and seeks to create a space where students can extend loving kindness towards themselves and leave class feeling light, calm, and at peace. Carin Lowerison is a mom to three amazing girls, arts professional and Hatha yoga teacher who moved to Kitchener from Toronto in 2013. She completed her first yoga certification in 2007 at the Yoga Studio in Toronto under directors Michael Siddall and Cynthia Cooperstone. To date, Carin has accumulated over 400 hours of teacher training and continues to cultivate her craft through ongoing study. Her teaching draws on various Hatha yoga styles and is strongly influenced by her long-time study of Anusara yoga. She encourages a playful and intense yoga practice and teaches with great authenticity, enthusiasm, and care for her students. Her classes are theme-based, heart-centered, and always an adventure. Her hope is that when you meet yourself in your practice, it will be a time of insight, creativity, and celebration that will inform and enrich all aspects of your life off the mat. Carin is continuously moved by yoga's potential for teaching empowerment, dignity, grace and awareness. Jessika Marie is a yoga teacher, Functional Medicine Coach, former Birth Doula and Women’s Work facilitator. She has expanded her yoga offerings to include Street Yoga, The Way of the Happy Woman and Inner Quest for the Yoga Educator in addition to her foundational training in hatha vinyasa, restorative and pre-postnatal yoga. Over the last decade she has dedicated her work to serving both family and community, partnering with several outreach programs to provide both pre and postnatal yoga and art to single moms, their children and at risk youth. She has three children, ages 17, 12 and 1, which gives her a unique perspective, mothering across a broad spectrum of phases and ages, her own and her children’s. Most recently has been mentored by Kimberly Ann Johnson, bestselling author of The Fourth Trimester: A Postpartum Guide to Healing your Body, Balancing your Emotions and Restoring your Vitality. Over the course of two years Jessika has been both mentored by Kimberly and has mentored her students of Forging a Feminine Path: An Embodied Conversation on Sexuality and Spirituality. She is an active participant in her Activate Your Inner Jaguar course and integrates the principal of a healthy nervous system into her yoga classes. She is the founder of Mavens for Mama a business that involves birth preparation and postpartum guidance, rites of passage and ceremonial facilitation as well as a conscious giving program that distributes mother centred gift baskets to marginalized women in her community. Jessika is the facilitator of a nine month program, co-created with Kimberly Ann Johnson for women that is designed to guide women back to their feminine bodies and create a new healthy language for their sexuality, nervous system and spirituality, launching in 2019. For more on these offerings please visit mavensformama.com and find her on Instagram @mavensformama. Jessika is honoured to be a part of the Amma Yoga team and to offer Mom and Baby classes. She is grateful for the space Thea has created that is inclusive for all bodies and abilities and allows mothers to both work and be with their children. Jessika is thrilled to offer Mother Blessings, Postpartum Sealing Ceremonies and Mama Groups in addition to her regular class. You will find Jessika's youngest daughter Maeven by her side as her most trusted and spirited co-teacher. Jordan Rowe teaches a vinyasa "feel good" style class filled with variations to suit everybody, wherever they are on their yoga journey. She strives to create a welcoming atmosphere, and encourages students to take yoga off the mat and into their daily lives. Jordan is passionate about teaching how to build body awareness as well as self awareness. Her first 200 hour yoga training was with Yandara in Bali, Indonesia. Following this adventure, she co-led a retreat in Switzerland, focused on yoga, meditation, as well as handstand and arm balance workshops. This past year, she traveled to Rishikesh, India to complete Rishikul Yogshala's 300 hour yoga teacher training. Her hands-on assists in class are informed by a training in Thai Massage. Jordan is a proud Aunt to her beautiful 3 year old Niece, Audrey, who sparked Jordan's love and interest in all things prenatal yoga. Recently she had the privilege of travelling to Uganda, Africa to complete her Prenatal Yoga training, studying and stayed at the maternity centre and inspired everyday by birthing mothers. She plans to study massage therapy and doula support, and is a closet coffee addict. Julie Raineault has been practicing yoga for over a decade and knew very early on this was something she wanted to share. Julie believes strongly that yoga is for everyone, no matter your age, shape or ability there is something special everyone can take from coming together in this practice. She works to create a nurturing and inclusive space where people can explore their bodies without judgement. Julie’s classes strive to help balance work and reward, her Flow & Slow classes combine both an active asana practice and a chill restorative practice. She believes life moves quickly and you need take in all the beauty you find along the way, having balance in your life helps you keep your eyes open so you can take it all in. Julie completed both her 200 Hour RYTT certification in Alignment Based Hatha at Queen Street Yoga and her Yoga For Round Bodies™ YTT certification with Tiina Veer in 2016. She is looking forward to more asana and movement explorations in the future. Jyoti Solanki grew up observing her grandfather and father practicing yoga daily. Following this inspiration she has been exploring movement through dance and yoga ever since. She studied yoga outside of her family when she was a young adult, training in styles such as Iyengar, Asthanga, Power Flow Yoga, Restorative, as well as in depth study in Ayurveda. What she discovered was how vastly different yoga can be from one discipline to another. Today her focus is on allowing space for every individual in her classes to practice in their own way. Jyoti completed her 500 hour teacher training with Mandorla Yoga Institute in 2013 and has been weaving her work as a Registered Massage Therapist with her teaching style. She is also a Yoga Therapist with the IAYT. A creative and passionate practitioner, her goal is to guide anyone who comes through her door towards their health goals. Ever a student, Jyoti continues to seek out additional training and experiences that will allow her to grow with the flux of the world. Through that lens she seeks to share all her knowledge with her students and clients alike. Combining vinyasa and therapeutic applications in all her classes, she encourages her students to connect with their own expressive movements. Every experience is an opportunity to learn something new and for Jyoti the various styles and disciplines of yoga are each golden paths to the same goal. Karla Rivera has always been passionate about movement whether it's yoga, dance or going for a hike in the woods. Her journey as a yoga instructor began in 2010 in the beautiful town of Ubud, Bali. She loves teaching and connecting with people of all ages, from the littlest yogi sprout to the tallest oak in the forest! 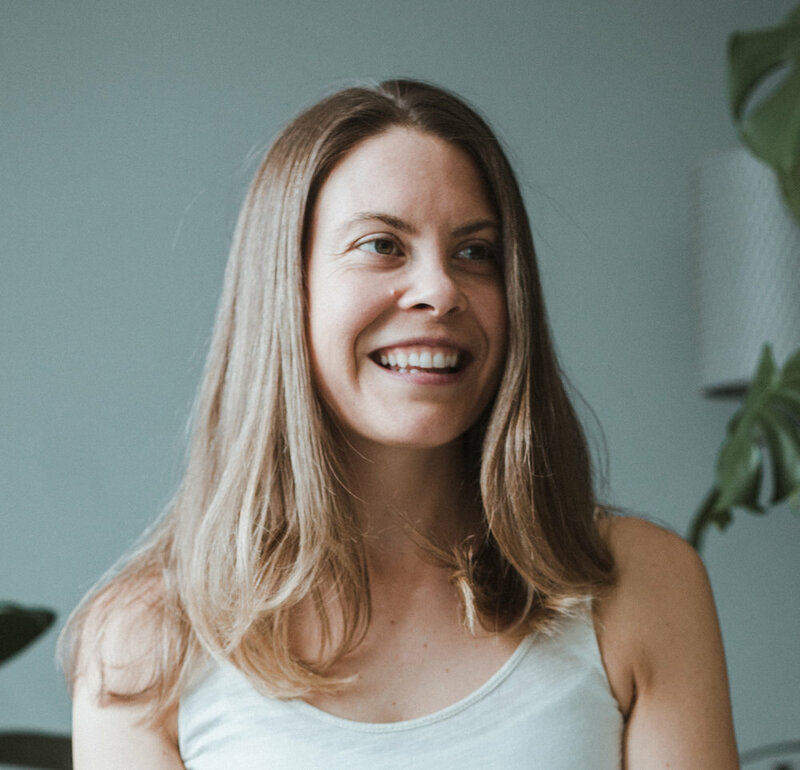 Laura Mack is a 500+ hour Certified Yoga and Prenatal Yoga Instructor, who taught full time in Toronto before moving to Norfolk County and then recently relocating to Kitchener-Waterloo with her husband and their two puppies, Kaos and Pringle. Specializing in prenatal and therapeutic yoga, she has worked closely with Registered Massage Therapist's and TCM (Traditional Chinese Medicine) practitioners to develop yoga programs for clients with a variety of needs and abilities. She completed the 200hr Yoga Fundamentals Program and 300hr Effective Teacher Training at Octopus Garden, focused on anatomy, physiology and yoga philosophy, followed by Blooma’s 45hr Prenatal Yoga Teacher Training at Toronto Yoga Mamas. Laura offers an all level prenatal class focusing on connecting mind, body and breath. She is also a birth doula and is working on her childbirth education certification. Manuela Soares of Ki Pilates has been working in the fitness industry since 2002 and is passionate about holistic well-being. Every day she sees people limited by pain or movement restriction, usually due to injury or habitual improper movement or posture. Her breadth of experience in mindful and functional movement helps students regain control of their lives and prepare for a strong future. Her classes encompass alignment-based exercises, which come from a variety of methods including Pilates, strength training, Feldenkrais, and ELDOA techniques, with personalized attention to help her students optimize their movement. Megan Adele found yoga by accident in 2010. Wanting to see what all the hype was about, she went to a class with no expectations, but after the first class she was hooked and knew that yoga needed to be a bigger part of her life. She completed her first 200 hour training in Costa Rica in April 2014 focusing on Ashtanga/Vinyasa, and then a 500-hour teacher training in Power Yoga with Empowered Yoga. Later she was lucky enough to study Yin Yoga with Joe Barnett, Prenatal Yoga at Mamata Yoga, Meditation with Matthew Remski, Yoga for Aging Gracefully/Chair Yoga with Heidi Mason, and most recently Rocket Yoga with Asta Yoga in San Francisco. She is also a certified Barre instructor, and a certified Birth Doula. For the last few years, Megan has been lucky enough to combine her love of travel with her passion for yoga and leads wellness retreats and teacher trainings in Costa Rica, Cyprus and next up Nicaragua! 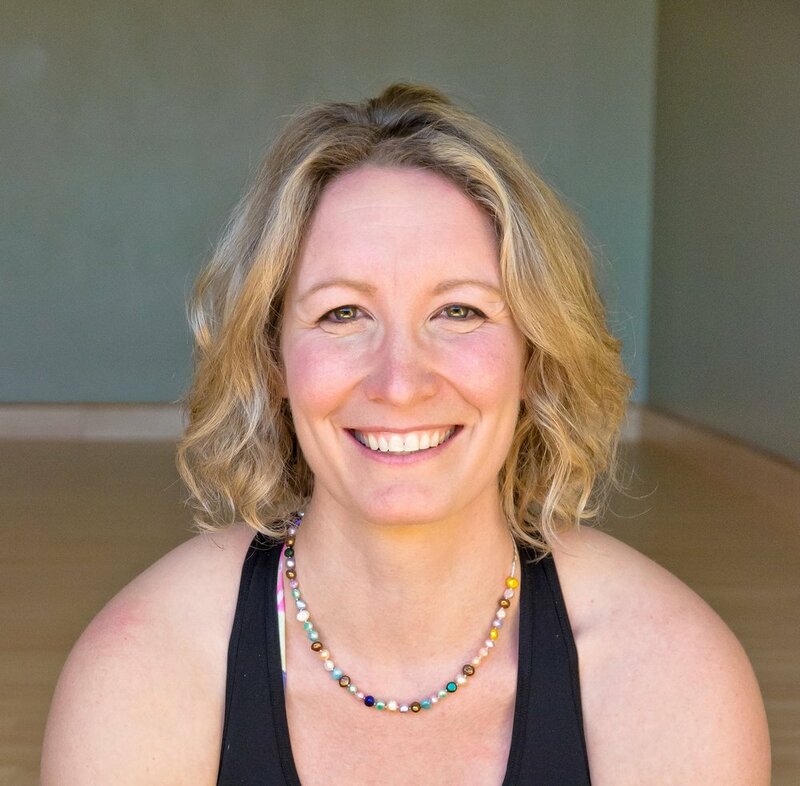 Megan likes to keep her classes light-hearted and fun, with a major focus on connection to the breath and linking movement with breath. When she is not on her mat you can find Megan making handmade meditation malas, playing with puppies, or enjoying a local craft beer! Megan Prenty is a 500 hour Registered Yoga Teacher and Massage Therapist. Megan first discovered yoga as a teenager to balance heavy athletics in high school. Megan became Massage therapist in 2007 and sparked a deep love of anatomy, movement and public health. In 2011 Megan attended the Vancouver School of Yoga and took a 200 hour Hatha yoga teacher training. Megan began teaching beginner Hatha and family yoga in Vancouver. She has been grateful to be able to teach across British Columbia, at retreats in Goa, India and locally in the Waterloo region. Passionate about anatomy and continuing education Megan returned to her studies and completed a 500 hour yoga teacher training in 2017 from Semperviva Yoga and is currently pursuing a bachelors in health sciences. Megan's family yoga are play based and explorative of physical postures as well as incorporating mindfulness techniques. Megan's adult classes are anatomy based to create a gentle opening while bringing awareness to the breath. Since moving to the region in 2013 Megan has been teaching family yoga, beginner yoga, gentle Hatha yoga, restorative yoga and meditation mindfulness classes. Off the mat, Megan loves to travel, hula hoop and explore local small businesses. Sandra Van Dong-DeLaRonde discovered yoga nearly a decade ago, practicing at the gym and at home, but she truly fell in love with it when it helped her rehabilitate from a bad ankle injury. After pursuing traditional therapies, she turned her attention fully to yoga as she learned that it not only helped with flexibility, but also with strengthening and balance. The further she delved into her practice, she soon discovered that yoga and meditation was not only good for her physical strength, but also her emotional and mental strength. She acquired her 200 Hour Registered Yoga Teacher training in Baja California, Mexico, where she was trained in Asana, Pranayama, Meditation, Chanting, Anatomy, Prenatal and Restorative, as well as Physiology, Yogic Philosophy, Ethics and Lifestyle. Sandra’s approach to yoga is fun and nurturing and she loves inspiring others on their quest to improve wellness. She fully understands the need for balance in life, body and breath, and promotes self-love as a way of healing from the inside-out. In addition to teaching adults yoga, Sandra also teaches children's yoga in schools, grades K-8, where she loves introducing yoga postures and mindfullness to the young people shaping our future. She in inspired by their curiosity, willingness to grow and creativity. Sandra would describe herself as “not a typical yogi,” neither in looks nor in physical form (you won’t see her in a headstand, or a complex, twisted posture on her Instagram), but she defines herself as, friendly, open-minded and approachable. When she’s not talking yoga and meditation, she’s talking food and family. Sarah Michelle loves to share yoga with people who are looking for a way to add creative movement and opportunities of stillness to their lives. For as long as she can remember, Sarah has been involved in some way with sports and fitness. So, when she first began practicing yoga it was another form of exercise on her weekly calendar. She wanted to keep moving and dreaded the quiet moments of stillness. Over time, Sarah began to appreciate the pause that yoga offered both on and off her mat. With a consistent yoga practice, she felt a little more present in her life. Realizing the benefits yoga had on her wellbeing, Sarah began to share this insight with others. As an elementary school teacher, Sarah wanted to learn more about incorporating yoga practices in the classroom and in 2016 completed Yoga for Children & Families with Rainbow Yoga. While teaching children in the classroom, she discovered how moments of mindful breath and movement helped to re-centre and ground the energy of the class. After teaching for several years, she knew she could provide valuable lessons teaching yoga and mindfulness practices to people of all ages. In 2018 Sarah completed 200CYT with Pranalife Yoga in Kitchener/Waterloo. Sarah shares her love of movement, yoga and play in a non-competitive, supportive environment where everyone has an opportunity to shine! She welcomes everyone to her classes with a big bright smile and a warm friendly personality. Victoria Tolton first discovered yoga after competing with the National Synchronized Skating team as a way to recover from the physical and mental demands of training. She wasn’t sure at first if she was “calm enough” to be a yogi, but over time, the precision of the postures and their union with breath appealed to her meticulous and creative nature. Victoria’s approach to teaching is very anatomy-based, thanks to her extensive background in both sport and education. 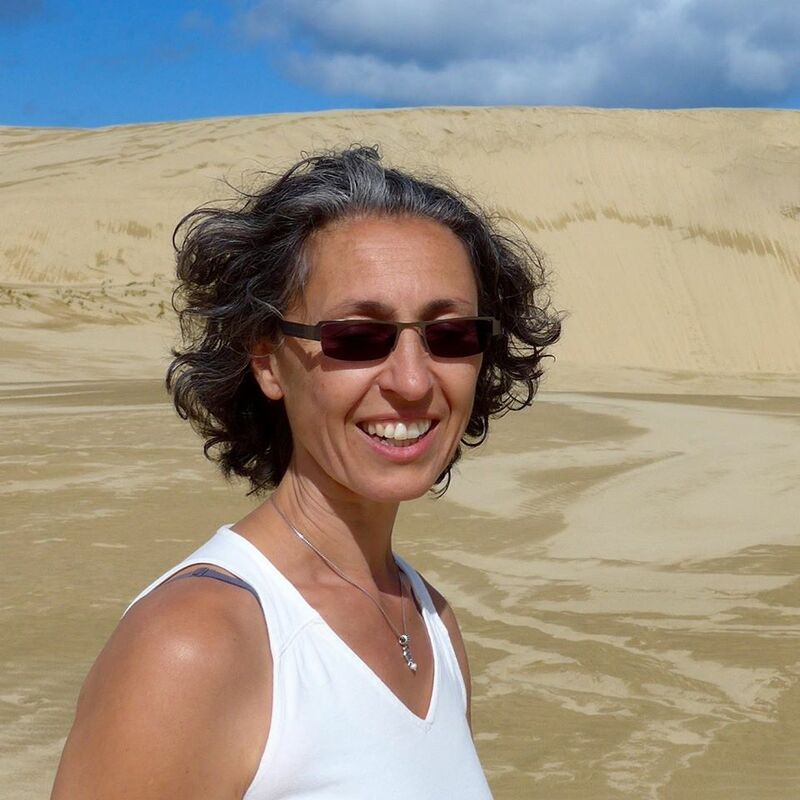 She has had the great privilege to teach yoga overseas, particularly in Greece, Turkey, and Scotland, while completing two graduate degrees in the area of Ancient Greek sculpture. She loves to learn and is always exploring new ways to develop her own practice so that she might be able to serve others better. For Victoria, the joy of yoga is inherent in its ability to mean something different to everyone who steps onto the mat. She will challenge you to leap outside of your comfort zone and explore the postures as a true expression of your own amazing and unique self!